I've had good intentions of keeping this blog updated, but haven't exactly been doing a great job! I have been posting regularly over at Scrap 'n Stamp Canada's blog in my Tuesday with Tara posts, so know that I haven't completely dropped off the face of the earth :) I shared a cheery little card this week and wanted to post about it here too- I'm still loving those Bird Crazy stamps Tim Holtz put out last year, and have been having fun with some mixing up of different media products and creating my own custom glazes with translucent texture paste! 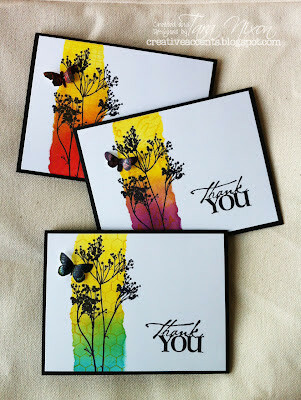 All the glitter was inspired by this Tim Holtz sentiment stamp... I had fun playing with my Color Burst paints over the dried paste on this background. I actually love how unpredictable it is, and the splotches of color you get... this combo of yellow and orange against my aqua textured details gives such a fun POP! And of course I had to finish of my crazy bird with a generous dose of Stickles Glitter Glue as well! You can read a bit more about how I made my card on the Scrap 'n Stamp blog and also enter for a chance to win some Watercolor Cardstock too! I post there every week and I'm going to try to share projects here more often too... I had a fair bit of extra paste after doing this background, so I should have some more projects to share with you using the extra backgrounds I create from it! I've got a bit of extra time before work today so I'm off to get my fingers inky... hope you have a great day!